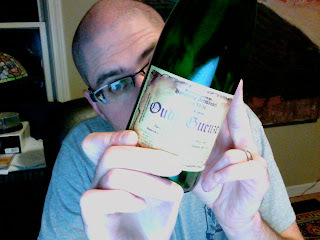 Ups & Downs: Oude Guezue from Hanssens Artisanaal..
Oude Guezue from Hanssens Artisanaal.. So, in my spare time today, I whipped up a 5.5 gallon batch of a brew thaat I intend to sour with some bug dregs I got from the above-mentioned Gueuze from Hanssens, in Belgium. It's a pretty good player, and I thought I could handle it myself after my partner couldn't make it up.. and you know, I sort of *needed* it (or, the junk on the bottom of the bottle, anyway..) to actually make a sour beer. I pitched two strains of yeast here.. a really old WYeast smack pack that failed to swell up, and the scum from the bottom of this bottle of sour. BTW, thanks Rob, for the ol' smack pack! Yep, this is *that* one! I didn't do any starters or growing of any sorts.. just pitched, crossed my fingers and I'm gonna hop for the best. Worst case, I could always pitch a dry yeast in the morning if I don't see anything happening.. but I think I'm jut gonna take the Papazian approach and just not worry about it. Anywho, the new beer consisted of mostly two row pale, a touch of both Crystal 20 and Crystal 40, a bit more of some Munich (the light variety..) and that's about it. I added a bit more layering of grains to this one than I did with my Oro de Maggie, cause, although that beer was (is?) really quite nice, it's a touch one dimensional.. I wanted to see if I could bring a bit more to the plate, so I used smaller amounts of specialty grains and layered 'em up on each other.. we'll see how that goes. Plus, I used the two strains here in the new beer, and just the Calabaza yeast in the Maggie beer. I've taken to calling this newest creation the Hanssens "No Problem" Sour Ale.. cause, well, I had no problems with the brew.. which is unusual, and sorta screws with my naming scheme. Since all my beers are usually named after a problem in the brew day, a dead animal, or a single hop beer indicating just the one hop involved.. this one sorta threw a wrench in the works. Maybe disaster will strike further down the chain and I'll get a real name for this thing in place. Until then..
Other than that, chickens are good, the kids are alive and well, and the wife has a migraine.. and I'm off to bed. Carry on!